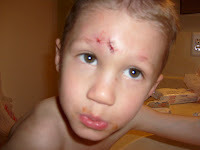 This Friday, I witnessed Milo take a head-on collision with some playground equipment. 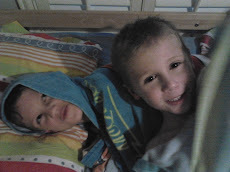 He split open his forehead- that with the nose bleed meant a ton of blood. It was all very dramatic. Stitches come out on Tuesday. We're going to treat the scar so it's not too noticeable. But, we all know that girls like boys with scars! On Tuesday we met our friends Sunjae and Chunee for dinner. Sunjae just finished his MBA studies at UT and he and his wife will be returning to Korea on Monday. It will be sad to see them go, but we're glad we got a chance to see them before they left. Sunjae was one of Milo and Joey's biggest fans. So tonight we were moving a few things over to the new place and doing a couple of loads of laundry. Milo and Joey were enjoying running around the empty condo. 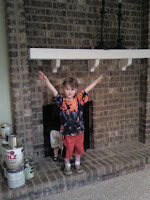 Without warning, Milo stopped in his tracks and said "Hey, there's no TV!" 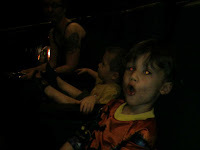 The boys got to see their very first movie inside an actual theater and they boys did great! Sure, Joey got scared a couple of times and Milo refused to wear his 3D glasses, but there was no screaming, crying, spanking, or anything. Oh, and their little 30 pound butts were not heavy enough to keep the flip-up seats down... but still, it was almost like we were a normal family!